The Virus and Vaccine, is a very important read. After having read it, I have come to the conclusion that the Polio Vaccine containing SV40 was a DELIBERATE act by the US Government to make sick and shorten the lives of the Baby Boomer Generation so that MANY would be dead by their 50s or 60s. Following generations are also affected, as SV40 is passed from mother to child, and is even found in male sperm. Sadly, children today are dying from brain cancers and bone cancers; SV40 is found in the cells of tissue samples. If you read this article, and do additional research, you will find what this article states is pretty much impossible to refute. It’s also important to know that during the time period in question, the dominate race in America was White. If you do demographic research you will find that Whites now represent maybe 60 percent of the US population. Many are now dead and/or dying from different types of cancers. There is also an important non-fiction book titled, “Dr. Mary’s Monkey”, by Edward Haslam. “Dr. 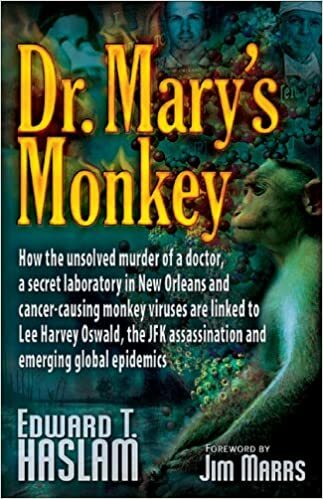 Mary’s Monkey” tells about the unsolved murder of a doctor, a secret laboratory in New Orleans, and cancer. It’s all linked to Lee Harvey Oswald, the JFK Assassination and the emergent of global epidemics. Haslam, who is also a former advertising music director, is the author of another book on the same subject titled “Mary, Ferrie and the Monkey Virus”. In 1960 Bernice Eddy, a government researcher, discovered that when she injected hamsters with the kidney mixture on which the vaccine was cultured, they developed tumors. Eddy’s superiors tried to keep the discovery quiet, but Eddy presented her data at a cancer conference in New York. She was eventually demoted, and lost her laboratory. What if the monkey virus could spread from person to person? And if the virus was cancer-causing, or oncogenic, what was one to make of the fact that millions of Americans had been exposed to it as part of a government-sponsored vaccination program? Too much was at stake. Implicating a vaccine contaminant in cancer — even if the contamination occurred some forty years ago — might easily shake public confidence in vaccines in general. Recent research also indicates that SV40 has gained a secure foothold in the human species. In 1996 Tognon and his collaborators reported that they had also found the virus in 45 percent of the sperm samples and 23 percent of the blood samples they tested from healthy people, suggesting that the monkey virus could spread through sexual contact or unscreened blood products. …decades after the contaminated vaccine was removed from the market. A surprising six percent tested positive — offering evidence that the virus may now be spreading from person to person, including from mother to child. Federal health officials are understandably concerned that any link between SV40 and human cancers could frighten people away from the polio vaccine and vaccination in general. To settle the issue Carbone sought to examine old vaccine stocks. He was told by government and drug-company officials that they had thrown out all the old lots. Then, two years ago, Carbone found an elderly Chicago-area physician who had an unopened case of polio vaccine from 1955, which he had stored in his refrigerator for more than forty years. “I would have gone all the way to Alaska to find this stuff, and here it was three miles away,” Carbone says. Last summer Carbone finally completed tests on the vintage vaccine. He found that the tiny vials contained SV40 genetically identical to the strains found in human bone and brain tumors and in monkeys. “This proves that the SV40 that was present in the polio vaccine is identical to the SV40 we are finding in these human tumors,” he says. The researchers suggested that SV40 may be a “viral cofactor” involved in the sharp rise in human brain tumors. Late last year an extensive study undertaken in China reinforced those results. The study examined sixty-five brain tumors, finding SV40 in each of the eight ependymomas and two choroid-plexus papillomas, common brain tumors among children. It also found the virus in 33 to 90 percent of five other kinds of brain tumor examined. Magnified 50,000 times under an electron microscope, SV40 doesn’t seem particularly menacing. It looks almost pretty — bluish snowflakes, against a field of white. The virus consists of six proteins, three of which make up the twenty-sided triangular scaffolding that is the virus’s protein skin. But one of the remaining proteins, called large T-antigen (for “tumor antigen”), is, according to Carbone, the most oncogenic protein ever discovered. It is unique, he says, in its ability to cause cancer when it is set loose inside a cell.